Is Manchester United and England’s record goalscorer worthy of a statue? Wayne Rooney divides opinions amongst most, but it is hard to overlook Rooney’s appetite and adaptability contributing to the array of goals and trophies collected over the years. Rooney is Manchester United’s greatest ever goalscorer in the club's illustrious history, but is he worthy of a statue alongside other club legends? Born in Croxteth, Liverpool, Rooney burst into the spotlight as a 16-year-old at Everton scoring a sensational goal against an invincible Arsenal team on 30-game unbeaten run, making Rooney at the time the youngest goalscorer in Premier League history. Sporting broadcasters were left commanding viewers to ‘remember the name’ of this unearthed talent. The baby-faced teenager commanded a fee of £27m in 2004 after rising to stardom at Everton, warranting a move to Manchester United. Pundits were left bewildered at the time by the gamble undertaken by Sir Alex Ferguson, despite this, it looks to be one of the best-value budget-blowing signings ever made. Thirteen years on Rooney is Manchester United’s and England’s all-time top scorer, surpassing both of Sir Bobby Charlton’s records respectively. A goals tally which saw him net 250 goals for Manchester United and 50 goals for England. Sir Bobby Charlton spoke highly of his successor to ManUtd.com: “It’s over 40 years since I scored the last of my 249 goals for Manchester United, so I must admit that I have become used to the honour of being the club’s all-time top goalscorer! "He is a true great for club and country, and it is fitting that he is now the highest goalscorer for both United and England. It has been great to watch him every week since his arrival at Old Trafford in 2004; he set the tone with a wonderful hat-trick on his debut and he has thrilled us all in the years since, going on to enjoy a hugely successful career. "I was 35 when I retired. Wayne is only 31 and still going strong, so I don’t think he’s done by a long stretch yet. He continues to show that he can contribute goals, assists and performances whenever called upon, he will raise the bar even further before he calls it a day. Now he’s the man to beat, and I can’t see anybody doing that for a long, long time” speaking to ManUtd.com. Old Trafford became the central cathedral of Europe that taught the art of scoring late and snatching victories from the maw of defeat. Under Sir Alex Ferguson, United made it a habit of winning late under that man, Rooney, often executing the killing off job to perfection. Of Rooney’s 250 goals scored for United, 101 goals came after the 60th minute, of which 55 goals in the final 15 minutes and a further 30 more have come as winners. As he became to mature as a player, the habit of scoring in any game at any time became frequent week-on-week. The United front-man also boasted an impressive track record against other title contenders: scoring 12 times against Arsenal, 11 against Manchester rivals Manchester City and 9 at Chelsea. Rooney’s shyness and lack of eye contact was often documented largely throughout the media at the beginning of his career, but despite this, the footballing world has seen a player evolve over his prosperous career. The Scouse teenager has since led club and country, and achieved records that will stand for the foreseeable future. However, Rooney has still accumulated his critics over the years with many United fans not classing Rooney in the same league as legends such as; Paul Scholes and Eric Cantona. In 2010, a 40-strong group of United supporters dressed in hooded tops and balaclavas were seen making death threats outside Rooney’s home in Cheshire. Rooney expressed his desire to move to local rivals Manchester City on a £260,000 a week contract, which would’ve made him the highest-paid player in the Premier League at the time. Off the field problems often overshadowed the impressive performances on the pitch for Rooney, with many United fans not forgetting the financial greed shown to join local rivals City. Will Rooney join the ranks of Best, Law and Charlton? Visiting Old Trafford pre-Watford victory on February 11, fans were keen to share their opinions on whether or not Rooney should be remembered in the form of a statue outside the stadium. Harrison Holmes said: “100% no statue for me, he’s tried to leave us twice under bad circumstances. “He’s a great player and servant to the club, no doubt, but he’s not a man of the people or a fan favourite. I haven’t seen him stop outside Old Trafford once to meet fans. 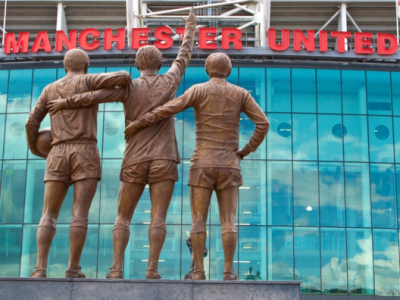 A statue outside Old Trafford’s East Stand features Best, Law and Charlton together, all regarded by United fans as club greats. Joe Gray said: “We all appreciate all the goals Rooney has scored for us, and all the trophies he played such a big part in winning. Recent media speculation states that Rooney has been given the go-ahead from manager Jose Mourinho to talk to foreign clubs in China and the USA, with Chinese club Beijing Guoan offering the United captain a staggering £32 million-a-year deal, in an attempt to try and lure Rooney away from Manchester. With China’s transfer window not due to close until February 28, it means the deal will not be affected before the UK Deadline Day on January 31. Rooney’s career in recent months has seen manager Mourinho favour other options over the United skipper, with just eight Premier League starts, it looks as though his career at United is coming to an end. Aside from the achievements at United, Rooney also broke national records after surpassing a record unbeaten in over 50 years set by Sir Bobby Charlton. After breaking onto the Premier League scene with his goal against Arsenal aged, 16 years and 360 days old, then-manager, Sven Goran Eriksson saw the prolific youngster play and immediately gave him a call-up to England’s senior side. A few months after making his international debut, still aged just 17, Rooney found the back of the net during a European Championship qualifier against Macedonia – an equaliser which helped England on their way to a 2-1 victory. Just 206 days after breaking the record for England’s youngest ever player he was at it again, this time becoming England’s youngest ever goalscorer. While Rooney’s younger years were largely ground-breaking, astonishing and successful, they were also littered with little events which often overshadowed his brilliance. A stamp on former team-mate Cristiano Ronaldo during the 2006 World Cup quarter-finals between Portugal and England, will often leave a sour taste in the mouths of England fans, with the anticipation of winning a second World Cup quickly diminished with England, as always, losing at penalties. Most will often criticise him for not showing up in major tournaments, but it’s hard to look away from the goal scoring facts and the trophy accolades he boasts. Rooney’s record simply stands on its own. Forty years from now his goals, like those of Charlton – who was also sniffed at by some in his time – will be admired long into the future, setting a gruelling challenge to those aiming to surpass his records. A statue for Rooney? We shall see.